The final race of the 2018 Bennetts British Superbike Championship got underway in horrendously wet conditions on Sunday afternoon, and it was Richard Cooper for the Buildbase Suzuki team who came out victorious, as Leon Haslam (JG Speedfit Kawasaki) capped off his championship-winning BSB campaign with a sixth place. 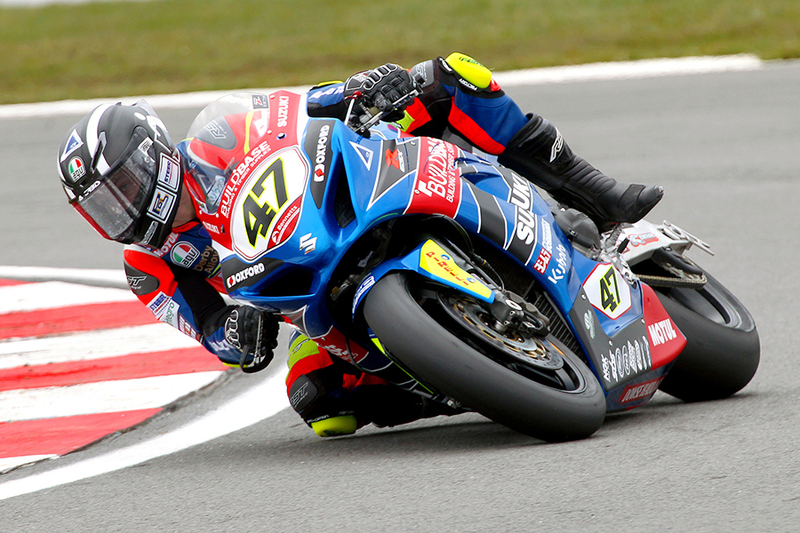 Cooper started from the front row, and used that position – and his Suzuki’s strength off the line – to make the holeshot, from which position he disappeared at the front, making just one mistake which kept him awake, and allowed Tommy Bridewell (Moto Rapido Ducati) behind to close up. Cooper responded, though, and within a couple of laps he had re-established a healthy margin at the front. Behind the diminutive Derbyshireman, there was a battle for second place between the aforementioned Bridewell, newly-crowned British Champion Leon Haslam, Jason O’Halloran (Honda Racing), Christian Iddon (Tyco BMW) and Jake Dixon (RAF Regular and Reserves Kawasaki). The group stayed together for a number of laps, before a mistake by Haslam let Bridewell escape the group, and cost the WSBK-bound rider a couple of positions. Eventually, the group spread out, and the 2018 BSB season finally went out with something of an anti-climax. Cooper came away with what was an impressive victory in awful conditions, in what may turn out to be his final BSB race, whilst Tommy Bridewell was able to hang on behind to second place, and another podium for the Moto Rapido Ducati squad. They were joined on the podium by Grand Prix-bound Jake Dixon, who made amends for his race two crash with a podium in his final race for Lee Hardy and the RAF Regular and Reserves outfit after he pulled away from Christian Iddon and his split collarbone who came home in an impressive, heroic fourth. Josh Brookes ended his time with the McAMS Yamaha team with a top five (5th), with a late charge allowing him to climb up the order in the final stages, although he fell just over half a second short of Iddon’s fourth spot. It’s not been a stellar year for the 2015 champion, and he will be hoping his move to PBM for 2019 will prove more fruitful. Conserving both his team’s 100% finishing record, and his special, one-off gold fairing was behind the sixth place of Leon Haslam, as the 2018 champion cruised to sixth place after a series of rear-end slides, including a pretty spectacular one through Clark Curve. Haslam now has three weeks off, before he jumps on the new Kawasaki for 2019 preseason testing for the factory Kawasaki WorldSBK team. A personal best finish of the season came in the shape of seventh place for Gino Rea, which was a good way to end a tricky year for the class rookie. After fighting for the podium positions in the early laps, Jason O’Halloran somewhat mysteriously slumped to a finishing position of eighth ahead of the Smith’s BMW pairing of Peter Hickman and Sylvain Barrier, who were 9th and 10th respectively. Bradley Ray (Buildbase Suzuki) came home in eleventh, ahead of newcomer Danny Kent (Movuno.com Halsall Racing Suzuki) in 12th, Mason Law (Team WD40 Kawasaki) in 13th, Shaun Winfield (Anvil Hire TAG Racing Yamaha) in 14th and Aaron Zanotti (Team 64 Kawasaki) who took the final point of the season in fifteenth, in his final career race. Michael Laverty (Tyco BMW) was the first crasher, as he high sided on the exit of Surtees, which was an unfortunate way to potentially end his BSB career. He was joined on the side lines by Joe Francis (Lloyd and Jones Bowker Motorrad BMW), Luke Mossey (JG Speedfit Kawasaki), James Ellison (Anvil Hire TAG Racing Yamaha) in what could be his final BSB race, Dean Harrison (Silicone Engineering Racing Kawasaki), Glenn Irwin (Be Wiser Ducati Racing Team), Josh Elliott (OMG Racing UK LTD Suzuki) and Andrew Irwin (Be Wiser Ducati Racing Team). Next PostNext World Rally Championship Calendar 2019 and Driver Line up’s.